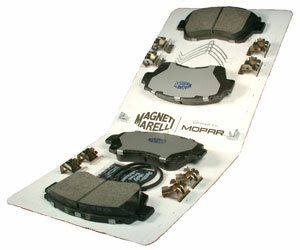 Magneti Marelli's all-in-one All Makes Brake Pad Kits come complete with stainless steel hardware for easier installation and less vehicle downtime, while reducing the possibility of premature wear-out due to worn caliper hardware. The high quality friction materials used allow for ultra-quiet braking and the elimination of that unsightly brake dust that appears on your rims from using lower quality materials. Available in semi-metallic and ceramic formulas, these brakes provide excellent stopping power and superior braking performance.